Jayalalitha is dead. Sexism in Indian politics is alive. Yesterday, an astute politician and a popular leader, Jayalalitha passed away. There has been a spontaneous outpouring of genuine grief and deep dismay among most Tamilians. By all accounts, Jayalalitha had led an extraordinary life. From becoming a film heroine at the age of 16 to being a chief minister at the time of her death, much of Jayalalitha’s journey had been larger than life. She had had to display exemplary courage and tremendous willpower to defeat formidable foes, surmount numerous obstacles and beat impossible odds. Each time she was deemed vanquished, she rose like a phoenix from the ashes, stronger than ever before. And yet many of us are puzzled by her popularity, uncomfortable with the devotion shown to her and scornful of what we consider as the mindless sycophancy that reigns around her. The underlying source of all this thinly disguised distaste is our deep-rooted and firmly entrenched belief in the inferiority of the woman. In plainer words: sexism and patriarchy. And so we circulate memes making fun of Mayawati and Mamata Banerjee. We cackle at the sartorial choices (Pink salwars) of Mayawati and roll our eyes at the ‘theatrics’ of Mamata Banerjee. We project our women leaders as stupid, illiterate, irrational, despotic drama queens scheming their way to power. With a smirk and a shrug, we proclaim “Little wonder that no one wants to marry them. Who would be able to tolerate their antics?” But it is actually no wonder that they end up looking as remote and bitter women. And when I repeatedly use the word ‘we’, I refer to the smug, educated class of Indians to which I belong. The ‘illiterate masses’ of India seem to be far wiser. It is they who voted Indira Gandhi to power. It is they who gave Sonia Gandhi a resounding mandate in 2004. It is they who ensured that three of our chief ministers were women. We of course chose to sneer and forward memes on whatsapp. Politics is the strongest bastion of the male species. It is through politics that the woman is controlled and subjugated. And so the key to power is fiercely guarded and any incursion by a woman is vehemently opposed. It took Indira Gandhi with Nehru for a father and Gandhi as a surname to finally storm the bastion. Even then, she was made the prime minister because of the arrogant sexist assumption that she would remain a ‘goongi gudiya’ (puppet) in the hands of older men. When she went on to assert her independence and led India to victory over Pakistan, she was lauded as the ‘only man in her cabinet’. Such is the role that patriarchal symbolism plays in Indian politics. Not everyone has the advantage of a surname and the luxury of a lineage. And thus, the Mayawatis, the Jayalalithas and the Mamata Banerjees are ridiculed and insulted. In her early political career, Jayalalitha was subjected to numerous lewd insults and even hair pulling. In the assembly, the so-called temple of democracy, she was almost disrobed. And so she had to re-brand herself as Amma. She had to de-womanize and de-sexualize herself by wrapping herself in layers of clothing and denying herself any jewellery. This was the only way she could survive, the only way she could protect her dignity and the only she could access power. And for this we call her remote, bitter and a despot. Similarly, both Mamata Banerjee and Mayawati had to undergo this process of desexualisation by branding themselves as ‘Didi’ and ‘Behenji’ respectively. And Mayawati of course had to bear the additional onerous burden of being a dalit. This post is not to suggest that women leaders are immune to wrong doing or that they are more efficient or less corrupt than male politicians. Women leaders are of course vulnerable to all the trappings of power that their male counterparts succumb to. It is only a plea, asking you to judge them as you would any other politician and not hold them to higher standards. It is only to highlight the struggles that they have faced and the heroic battles that they have waged; to highlight the enormity of their achievements and the magnitude of their accomplishments. They don’t ask for your sympathy, but at least spare them your contempt. This post is also not about criticizing or shaming the educated class. It is a request to identify and acknowledge the latent sexism still entrenched in our psyche. I do not claim that sexism prevails only among the educated class or that it is only prevalent in India. Far from it. It is merely a passionate plea, asking you to use the advantage of education to eliminate sexism and not promote it. Each of us thinks that it is the others and not we who are sexist. But it is not just their malice and violence that breeds sexism and sustains patriarchy, it is also our scorn and indifference. Those memes are not funny and neither are they not harmful. 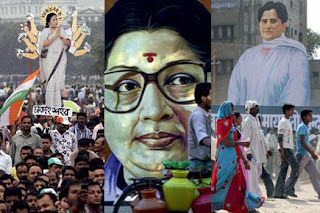 p.s: When the statues of Jayalalitha are erected across Tamilnadu, as they inevitably will, for once, I will cherish and celebrate idolatry; because for years to come, young girls will have someone to inspire them, someone who was not just a mother and a sister, pious and chaste, but an independent woman who took on the might of patriarchy and the power of sexism.